Nick Foligno plans to be healthy and back in the lineup for Game Three. Columbus — In the wake of last night’s double overtime 4-3 victory over the Penguins in Pittsburgh to even the series at 1-1, the Blue Jackets held an optional skate this afternoon at Nationwide Arena. After a gritty, hard-working, come from behind win, they deserved a day of rest. To a man, they are focused on the task at hand that will unfold tomorrow evening in the friendly confines. Head coach Todd Richards remembers the last game of last season and how excitingly electric the atmosphere was. "I’m expecting it to be a lot like the Nashville game (last year)," he said. "And I’m hoping that it will be taken to another level." Two games stand out that positively scream "edge of your seat" excitement, the Nashville game last year and Game 4 versus Detroit in the 2009 Stanley Cup Playoffs. If social media from last night and into today is any indication, Game 3 on Monday will blow the roof off the arena. At this point, the city is beyond the "buzz" stage. It’s more like a powder keg with a lit fuse. 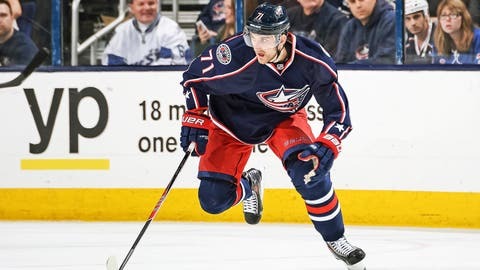 Forward Nick Foligno, out with a lower-body injury since April 3, will likely draw back into the lineup for Game 3 tomorrow against the Penguins after being medically cleared yesterday. "He skated today," said Todd Richards. "He’s good. We’ll see about getting him in the lineup tomorrow." Foligno missed the last six regular season games and the first two playoff games in Pittsburgh. His speed, grit and tenacity will be a welcome addition as Columbus looks to take the series lead on home ice. Richards declined to talk about the possibility of Fedor Tyutin playing in Game 3. "No update on Fedor," he said. Playoff-mode is here and Richards said he wouldn’t get into injuries with the media. Both Dalton Prout and Nick Schultz skated in the optional practice this afternoon. Head coach Todd Richards knows that it’s only one game that they’ve won in this series and expects Pittsburgh to play a tough game tomorrow. "They’ve (Penguins) been in this position before," he said, "they’ve been here, I guarantee it. I guarantee they’ve been 1-1, Sidney Crosby and Malkin haven’t scored, haven’t got the points that maybe they wanted." "You can say they’ve been frustrated, (but) they’ve been through it. They know how to deal with it. What we need to do is just stay on track, stay on cue with what we need to do. Just come out and play ‘Blue Jacket hockey’. Getting it in, forechecking and making them play a 200 foot game. If it’s anything less than that, it favors them."